Crafters love it; foresters hate it. 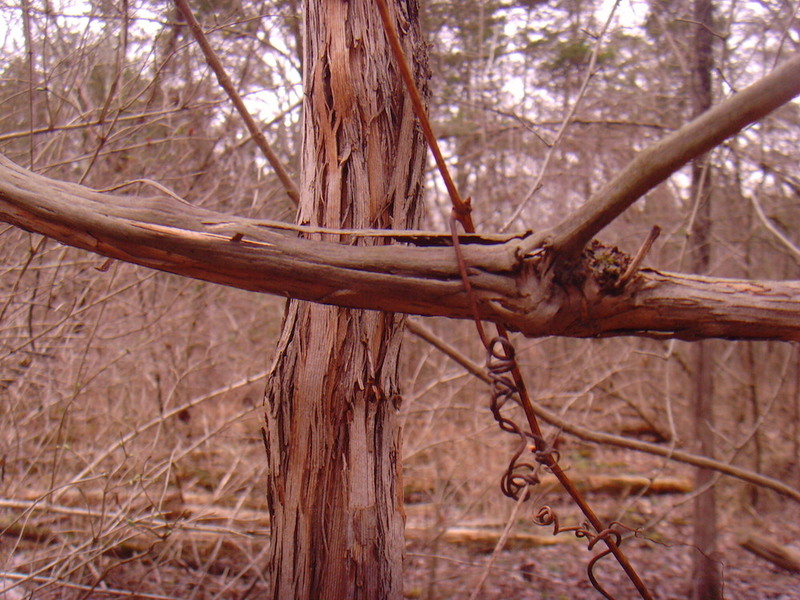 The woody vine of the Pennsylvania grape (Vitis L.) is one of our natives. Yes, it can be problematic as it grows into the canopy. But it also coexists, meaning it provides as well as takes, primarily by feeding the birds. The thick, meandering vines add interest to the drab winter scene. In summer, it entertains the kids who swing from the heartiest ones before splashing into the water. 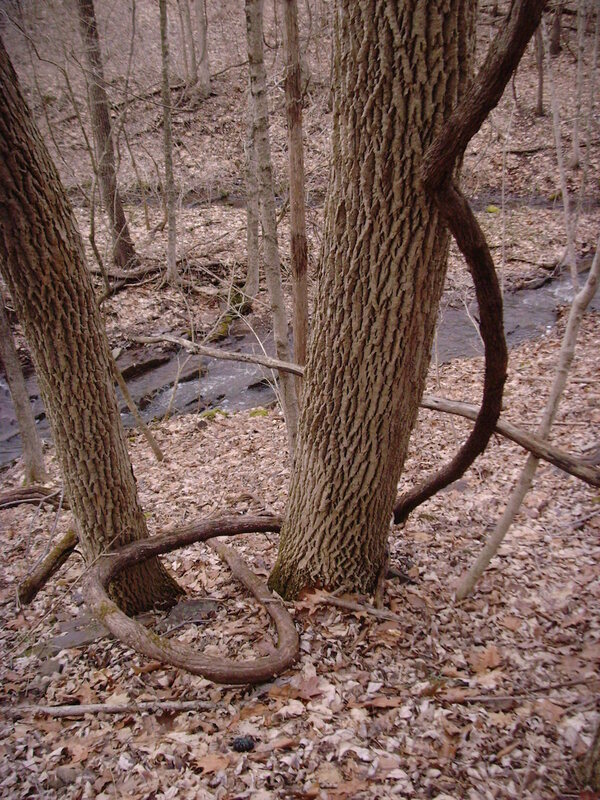 Be careful when clearing your wooded property; not all vines are foreign foes. 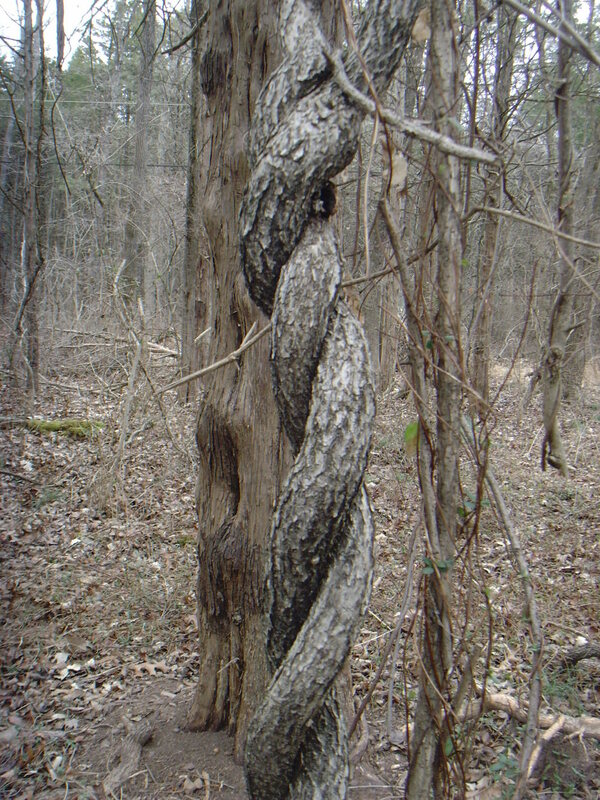 From the archive, the snake-like plant is a native grapevine. Three sizes of grapevine, the thinest of which is often wound into decorative wreaths. Although I haven’t identified this one, it is most certainly NOT grapevine. Grapevine does not braid like this. Given the choking damage this one causes, I’ve declared it my botanical enemy. Just don’t mistake a well-established poison ivy vine for grapevine! Ah yes, Paula. There’s a ton of poison ivy here, too. That’s a great example of another native vine that can be a problem in some conditions but should be left alone when possible to feed the wildlife and decorate the scene. Thanks Warren. I appreciate your input. I’d been told it was bittersweet; it looks and acts like Oriental bittersweet, but because I’ve never seen the blooms or fruits, I didn’t want to offer the positive idenfication.